Saved by a crocodile? 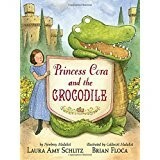 Yes, in this lively tale of an overworked, bored princess it is possible to be saved by a crocodile. Cora is bored with her lessons and very lonely. All she wants is a dog. She writes a letter to her fairy godmother, tears it up and throws it out the window. But the pieces sprout wings and fly away. The next morning, a box is at the end of Cora’s bed. Her crocodile has arrived. The crocodile dresses up like the princess, in her pink frilly dress, to take her place. Cora gets a day off. It is a touching story full of great illustrations and huge laughs. Librarians and teachers can use it for read aloud time or parents for bedtime reading with their children. Nanny and the king both come around to the thoughts that a dog would be much better than this crocodile who likes to bite people. Of course, he prefers cream puffs and only bites people who are not nice to Cora. While the crocodile was causing all sorts of trouble back at the castle, Cora learned to be brave by climbing trees, building a fort and stepping in a cow pie. By the time her parents finally asked her what was wrong, she had the courage to speak up and tell them what she needed to be happy. While this is not a beginning chapter book, it is an early chapter book. It has short chapters and will be greatly enjoyed by second and third grader readers who can navigate it on their own. Boys dancing? You bet! 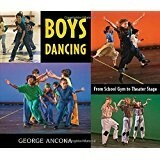 This title will invite more diversity to the theater stage and give boys permission to carry around a book about dance. Constant movement comes naturally to the four boys introduced at the beginning of the book while they are out at recess. From the playground to the gym, this large collection of full-color photographs follows children from several schools as they learn dance moves from a traveling dance teacher. Later in the school year, and in the book, the children are brought together to prepare for a dance recital. Each dance is tied to a favorite book. It is a fun look at what can be done in a school or community to introduce students to dance, music and well-loved books. Teachers, librarians and parents can use this book to introduce boys to the idea of dancing and bring such an activity to their own schools. As a read aloud, teachers could ask students what stories they would like to see added to such a presentation. Art teachers as well as classroom teachers can use the discussions about costumes to plan a character’s day dress up and play some music to get the class members all dancing. Written by Kwame Alexander, et al. Poems are as individual as the people who write them, but great poets do tend to develop a recognizable style. To help the reader learn about some of the world’s best poets, Alexander, along with Chris Codlerley and Marjorie Wentworth, write a series of poems celebrating those styles. Each poem tells a portion of the poet’s own story. Incredibly beautiful collages illustrate the feel of each poem perfectly. From the basketball scene for Walter Dean Myers to the forest for Pablo Neruda. 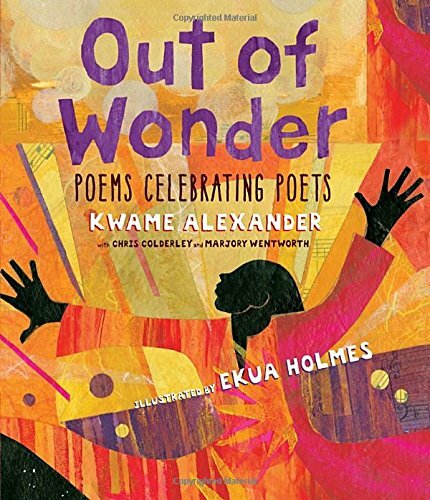 This is a must have for any classroom studying poetry. Kids will want to read the original poets and try their hands at adapting the styles to their own writing. Author: Kwame Alexander, et al. Children the world over, every single day are experiencing the destruction of their cities and lives by war. How can that be explained to the other children without causing unnecessary nightmares? Is there any possibility of teaching a positive response? Something capable of making a statement as well as offering survival? Flowers for Sarajevo is close to a perfect beginning. 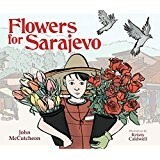 This beautiful, softly illustrated picture book relates a story based on the real bombing of one of the last bakeries in Sarajevo on May 27, 1992. The mortar hit at ten o’clock in the morning killing twenty-two people just standing in line to buy bread. But a most amazing thing happened the next morning at ten. A door across the block opened, a man wearing a tuxedo carried a chair and a cello over to the crater. He sat, played a moving concerto, folded his chair, and walked away. Then did the same for each of the next twenty-one days. Added to the true story is one of a flower seller and his son, allowing the story to be told from the viewpoint of a child. The child’s response is to pray for each of the broken families. He also leaves his unsold flowers at day’s end at the door of the broken bakery and the orchestra door. The story leaves many unanswered questions, does his father return? Does the bakery rebuild? But true to life, the questions remain unanswered. What the children will see is how the people support one another, how they all respond to questions without answers. Inserted inside the back cover is a CD with an original folk song by the author about the event, as well as a beautiful rendition of the concerto played by the cello. Teachers, librarians and parents will appreciate the depth of the author’s notes concerning the actual event, the biography side bar about the cellist, Vedran Smailovic, and the description of the, ”Region of War” complete with maps and suggestions for further reading. Even though this book is listed as a pre-school through grade three read, it is a book capable of being used to meet curriculum requirements in geography, social studies, language arts and current events in grades through middle school. Picture books can be used successfully far beyond elementary school. Librarians, teachers and parents, as well as guidance counselors can use this as a book club discussion book for talking about how people can respond to events. What helps us survive as people? How should we respond to trouble with respect and compassion for the people around us? Flowers and music are a powerful beginning.